The Equites Faction is the largest faction of heku. They are thought to be the strongest and most courageous faction because of their intense loyalty. 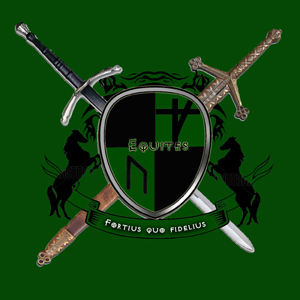 The Equites consider themselves a civil faction, but don’t hesitate for long before attacking an enemy. The Equites have kept the exact location of their main city, Council City, as a secret, but it is rumored to be located somewhere along the northern border of the central United States. The Equites have the largest population of ‘old ones’ and were the first faction to begin banishing the ancients. Heku rules are mostly followed by the Equites, unless a situation warrants the need to break them, in which case, the Council would make the decision on exactly which of the laws should be obeyed. The strength of the Equites Council is unmatched in the heku and most cower before them. Heku have been known to join the Equites for the sole purpose of becoming one of the infamous Council City Guards. The Council City Cavalry is comprised of the elite of those guards.